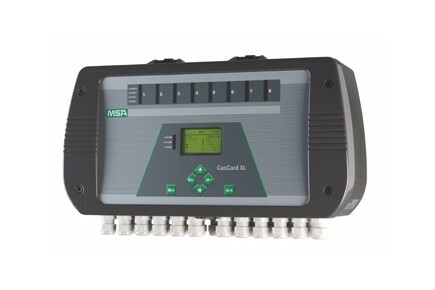 GasGard XL is a Multi-Channel Wall Mount Controller for monitoring toxic, oxygen and flammable gases in industrial plants. Due to its inherent versatility and ease of use, GasGard XL provides protection from potentially hazardous conditions in a variety of working environments and for virtually all health and safety applications. GasGard XL offers reliability in a compact and robust wall mounted housing made from fire retardant ABS material grade. The large, easy-to-read, multi-language LCD graphic display allocates real time information on target gas levels and events, allowing full system diagnosis, supported by individual LEDs per channel, relays and internal buzzer. GasGard XL can be easily configured to accept up to eight remote gas sensors, depending on the number of individual plug-in input cards installed. With two alarm levels per channel GasGard XL operates in conjunction with MSA’s well-proven remote gas sensors (flammable and toxic or oxygen 4–20 mA) as well as with catalytic gas sensors.